Introducing a new collection of Endless Pools Fitness Systems for customers that want a high-quality aquatic recreation product, at a price they can afford. 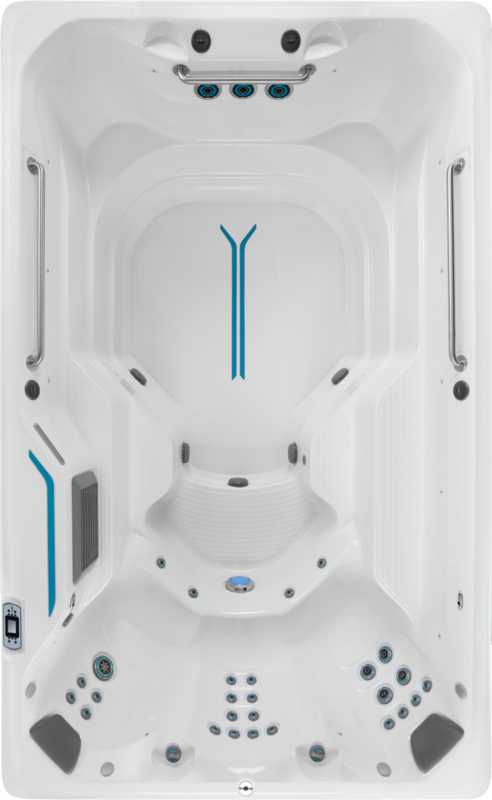 The all-new RecSport R120 features three variable-speed swim jets, exercise-ready grab rails, three comfortable spa seats with 27 hydromassage jets and additional bench seating to accommodate eight adults. The three swim jets use a venturi effect to multiply the water and produce force. This creates excellent resistance without turbulence, for a quality swim or aquatic workout. Water is kept crystal clear by a CD Ozone System that uses the hydromassage pump on low speed for regular water circulation. The R120 is powered by a single 24A service for greater energy efficiency. However, customers who want the flexibility to run the jets and heater concurrently may choose to field upgrade their electrical services. The R120 is built on a sturdy wood frame coupled with an ABS base pan that is built to last. The cabinet features an embossed pattern available in Mocha or Gray. Inside the cabinet, the R120 is insulated by the Tri-Thermic™ Barrier System, a standard feature on all Fitness Systems. The acrylic shell is available in Alpine White and Ice Gray with teal accents, similar to all other Endless Pools Fitness System models. All features combined, this an ideal aquatic recreation product for the entire family, at an affordable price!